If at first you don't see the halos and don't really understand the description, you might think this is just another painting by Gauguin about representing the exotic female body through the white, male gaze. 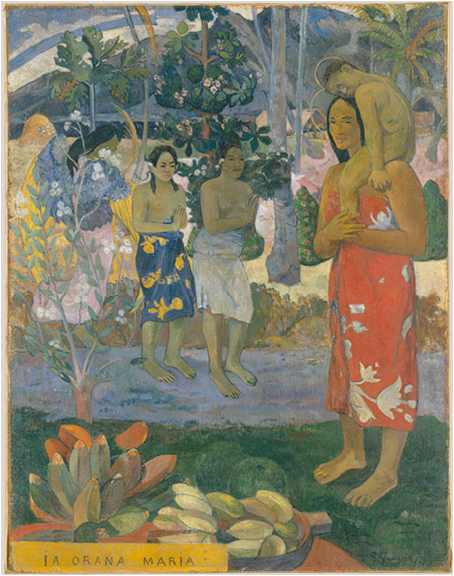 In fact Gauguin was religious and before he started his pictures depicting the Polynesian culture, he painted this canvas of a Christian theme. He has combined his version of Tahitian symbolism of the Maori women, nudes dressed in pareus with western symbolism of the Madonna and Child being revealed by an angel with yellow wings to the two Tahitian women who have their hands together in a western style prayer position. He has laid out the exotic fruits at the bottom of the painting like an altar, where the viewer can enter the picture before his/her attention gets drawn by Mary in a Red pareu with the Christ child on her shoulder. It was very radical for Western painting to have a brown Madonna and Child; as a matter of fact papal allowance for this was not given until 1951. Gauguin again gives his European audience what they would perceive as the exotic with the thick Maori bodies of the women only half covered in pareus which he described in a letter as "cotton cloth printed with flowers." 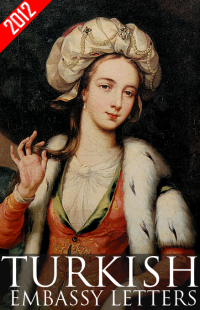 The women in Tahiti, in reality, were wearing missionary dresses, covered from neck to toe and the flowery, bright colored, cotton cloths in his paintings were made in France. He also didn't get his inspiration from Tahiti but from a photograph of a bas-relief in the Javanese temple of Borobudur; the body types and the vegetation are very similar in Hail Mary to the ones on the relief. He would probably defend himself by saying that he was a Synthetist and this was the poetry of the artist.